eBay Powered by Frooition FEEDBACK Kitchen & DiningTools & Home ImprovementHomePatio, Lawn & GardenClothingToysBeauty & Personal CarePro Audio & SoundPool & SpaSporting GoodsBabyCar Audio & ElectronicsConsumer ElectronicsExercise & Fitness Wenzel Kodiak 12 x 14 9 Person Family Cabin Style Camping Tent w/ Divider, Red Part Number: 36423R Wenzel Kodiak 12 x 14 9 Person Family Cabin Style Camping Tent w/ Divider, Red Main Features 14 x 12 foot cabin style family tent with enough sleeping space for 9 peopleStraight sidewalls and full coverage fly for added weather protectionFeatures a mesh Dutch D style door, 2 bay windows, 2 picture windows, and roof for visibility and ventilationRoof hubs, steel uprights, and pin and ring system make easy set upSewn in room divider creates 2 separate rooms DETAILS AND SPECIFICATIONS You know what's more fun than camping with a few close friends? Camping with all your relatives, and now with the Wenzel Kodiak 9 Person Family Camping Cabin Tent, you can do just that. Make the fun of camping in the great outdoors a full family affair. With enough room to sleep up to 9 people, this tent has 14 x 12 feet of floor space and a room divider for more privacy. 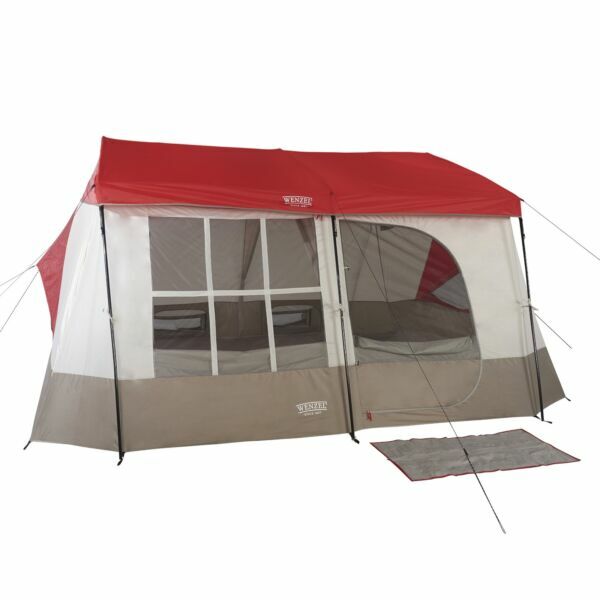 This cabin family tent also features a D style door for easy entry, 2 bay windows, 2 picture windows, and roof with rain fly for visibility and ventilation. Let in the light in the morning and keep that refreshing breeze going at night with the rear vents, which double as small storage nooks for camping gear. Whether you need sleeping arrangements for the whole clan or just want some extra space for relaxing on your next camping trip, this cabin tent will fit the bill. Features 14 x 12 foot cabin style family tent with enough sleeping space for 9 people Straight sidewalls and full coverage fly for added weather protection Features a mesh Dutch D style door, 2 bay windows, 2 picture windows, and roof for visibility and ventilation Roof hubs, steel uprights, and pin and ring system make easy set up Sewn in room divider creates 2 separate rooms Features rear lockers/vents for more ground breeze and storage Includes stakes, 2 gear lofts, 2 hanging pockets, mud mat, and storage duffle Specifications: Eave height: 65 inches Material: Steel frame, polyester Number of doors: 1 Number of windows: 6 Closure type: Zipper Sleeping capacity: 9-person Color: Red Total dimensions (L x W x H): 14 x 12 feet Tent height: 86 inches Manufacturer warranty: 10-year warranty Item Specifics Wenzel Celebrating 120 years of bringing families together and creating lasting memories.When the sun rose on the first family campers in America, Wenzel was there. We were there because we had been working hard for years protecting the brave explorers and pioneers that helped make America a place that we can take our families camping. Shipping VMInnovations offers FREE ground shipping on all orders within the 48 states with no hidden fees. Most items will ship to Alaska, Hawaii, U.S. territories, and internationally for an additional fee, but please refer to the Shipping and Payments tab to view our shipping rates. With 5 fulfillment centers nationwide, most items are delivered in 1-2 business days and when you place your order before 3 p.m. EST, it will ship that same day. For freight shipments, please allow additional prep time and note that we require a phone number for delivery. FREE curbside delivery for all freight shipments. We ask that you please provide a physical address for your order so it arrives on your doorstep safely and soundly as we cannot ship to APO/FPO/PO box addresses. Our team will ship your order to the PayPal verified address provided, so any address change request made outside of PayPal is not guaranteed. VMInnovations ships with Fedex, USPS, Ontrac, Lasership, and United Delivery Service. Payment To view all acceptable payment methods and sales tax information, make your way to the Shipping and Payments tab. Cancelling Your Order: Your order is important to us and will be processed immediately. If you happen to change your mind after payment is confirmed, our team will do our best to stop the order, but VMInnovations cannot guarantee the cancellation. Returns Returning Your Order: If you need to return something, we will happily accept your return for a refund within 30 days from the day it was delivered to your door. If you miss the 30-day window, we can exchange your item(s) so that you can find something else you"ll love. Please see the Shipping and Payments tab for full Return Policy details. Return Process: 1. Submit return request via the eBay Returns Portal. 1. Find the item in My eBay under Purchase History and select Return this item from the More actions drop-down menu. 2. Select the reason for the return. 2. Please ship the product back to VMInnovations with all original parts. 1. Return shipping is the responsibility of the customer. 3. Our returns team will quickly ship your replacement or refund your payment. Please contact Customer Service for additional warranty information. More Items!View more great items Powered by Frooition Frooition Frooition | No-js Template | eBay design, eBay store design, eBay shop design, eBay template design, eBay listing design (ver:froo_no_js) This listing is currently undergoing maintenance, we apologise for any inconvenience caused.